Music accompanies life because life—and creation itself—generates music, and cannot stop. At the moment of creation, God told Job so long ago, “the morning stars sang together” (38:7). How could they not? It thus fits that C. S. Lewis, in The Magician’s Nephew depicts Aslan the Lion singing all things into existence. The Lion was pacing to and fro about that empty land and singing his new song. It was softer and more lilting than the song by which he had called up the stars and the sun; a gentle, rippling music. And as he walked and sang the valley grew green with grass (p. 112). And when the rightful King returns, the Hebrew psalmist predicts, the creation itself will burst out in music so that “the hills sing for joy together before the Lord” (98:8-9). The music that wells up out of the heart reflects deep realities, even if a person’s heart has been made shallow by the brokenness of the world and by the idols it has adopted. Getting to know someone is impossible if we never take the time and care to listen thoughtfully to the music they love. It’s not a matter of liking it, but getting it, not a matter of making it my own but of loving you enough to hear it fully so that I can receive it and you. 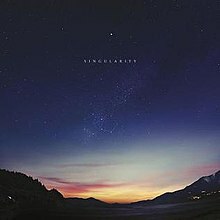 This came to mind as I listened to the fifth studio album by Jon Hopkins, Singularity. Hopkins began his musical career as keyboardist for Imogen Heap, and is probably best known for his creative work with Brian Eno and Coldplay. Early on his imagination was captured by the endless possibilities of electronic music, and the nine mesmerizing tracks on Singularity reveal something of his vision, and I suspect, his heart. Using meditative techniques and times away in the desert to nurture body and soul, Hopkins produces music that is beholden to no religious tradition but that sonically captures passing glimpses of transcendence. This is the reason for the title of this review, “Music of None Spirituality.” I hope it is not presumptuous. What I mean is this. Musicians of every time and place and religious tradition compose music that captures our most precious experiences. Experiences of loss and restoration, suffering and healing, love and wonder. It is not news that the fastest growing category of belief in America involves those who choose “None” when asked to state their religious preference. And it is also not news that many Nones insist that though they are not religious they are spiritual. I do not mean to suggest that Nones will like Singularity, or that Hopkins’ music will somehow resonate with their experience of spirituality. I can’t know for certain because I am not a None, but a Christian. Still, Singularity requires no adherence to dogma or ritual, but quietly celebrates the wonder of existence in a cosmos where beauty surprises and order takes our breath away. “Hopkins seems to model his music,” Brian Howe writes in Pitchfork, “on the infinite cycles of destruction and rebirth that power the universe—but we, too, are part of the scheme.” Sitting quietly and letting the music engulf me is like being on a trip, uncertain of what is around the next corner but happy to be going there to find out. Singularity can’t be understood or fully appreciated unless you are willing to stop and wait as the album plays, and to listen without distraction. It may seem, at first hearing, to be background music, and some use the album to go to sleep, but the layered depths in the tracks is an echo of someone who has been alone in nature and relished the wonder it evoked. “Singularity is an hour-long ode to spiritual transcendence,” Kelefa Sanneh says in The New Yorker, “that also resembles pleasant background noise—at least, it does at first.” Sanneh’s comment is not a put-down, since the spiritual realm is to our fallen senses, sadly usually in the background. Bring it into the foreground with Scripture, waiting quietly on God, unhurried prayer, and Singularity.